customer and product data as stored in an opportunity, if set up accordingly (see Enabling Opportunity Billing). Open the Invoice Runs tab. Specify the configuration details as necessary. Period Start/Period End: Specifies the period for the invoice run. Invoice Date: Specifies the date of issue for all invoices. If left empty, JustOn uses the current date. Select the invoice run filter as required. 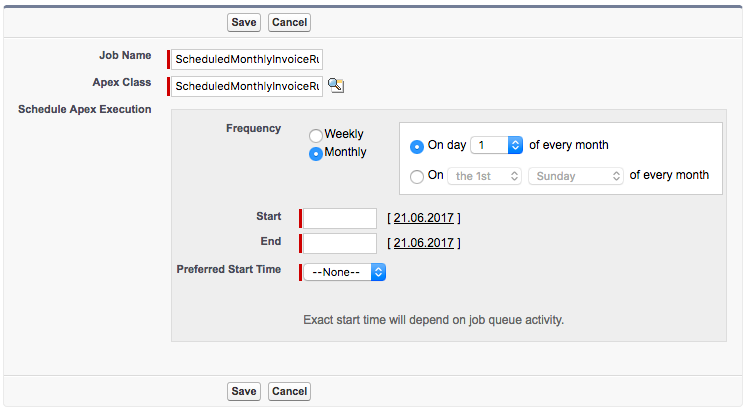 To limit the scope of subscriptions that are subject to an invoice run, select a subscription filter. This creates draft invoices from all subscriptions that are set Active and that are associated with an active account. In order to be considered by the invoice run, a subscription's start date must be within the invoice run period. This also applies to the start dates of the subscription items as well as to the transaction date. In addition to the usual invoice run, which processes subscriptions, you can execute a generic invoice run to create invoices from arbitrary objects that are configured accordingly. Make sure that the generic invoice run is enabled. For details, see Billing Arbitrary Objects. To define which records to include in the invoice run, select one or more generic filters. This creates draft invoices from all accordingly configured objects that match the filter criteria. You can execute an opportunity invoice run to create invoices from opportunities. Doing so produces one invoice per account, that is, multiple opportunities for one account are billed to the same invoice. Note that during the invoice run, JustOn initially creates the invoices from subscriptions, and then reuses the available invoices for the opportunity billing. Make sure that opportunity billing is enabled. For details, see Enabling Opportunity Billing. To define which opportunities to include in the invoice run, select an opportunity filter. This creates draft invoices from all subscriptions that are set Active and that are associated with an active account, as well as from all active opportunities that match the filter criteria. After creating draft invoices, you check them for correctness. If necessary, you must edit the draft invoices. Click the ID of the invoice you want to review. This opens the invoice in the detail view. The list view Recently Viewed does not display the Preview button. Click to open the action menu, then select Preview. This opens the draft PDF documents in a preview mode. Clicking Next or Previous allows you to navigate between the previewed invoices. Clicking View opens the detail view of the currently previewed invoice. If there have been deleted draft invoices from the latest invoice run, you can restore the invoices based on the corresponding subscription or opportunity. Re-running the invoice run applies the initial configuration (start date, end date, invoice date, etc.). Click the ID of the latest invoice run. Select the checkboxes of the remaining subscriptions/opportunities for which to create invoices. This restores the missing invoices, applying the original configuration. For review or testing purposes, your business may require to generate PDF files from multiple invoices in the status Draft. Make sure that the button Create Draft PDFs as well as a file distribution target for draft documents are available, see Enabling Draft PDF Generation. The list view Recently Viewed does not display the Create Draft PDFs button. On the Invoices tab, select the checkboxes next to the invoices you want to include in the draft PDF generation, or leave all checkboxes unmarked to include all listed invoices. Click to open the action menu, then select Create Draft PDFs. This creates PDF files for all selected draft invoices. The files are associated to the invoice records via the Notes & Attachments list. Find all produced files on Salesforce's Files tab in the group Owned by me, if not configured otherwise (see File Distribution). Make sure to delete the draft PDF files before finalizing the invoices to have JustOn generate new PDF files for the open invoices.